Holy Cross won its first contest in Hockey East play when it up-ended #5 Northeastern, 5-3, on Friday night. 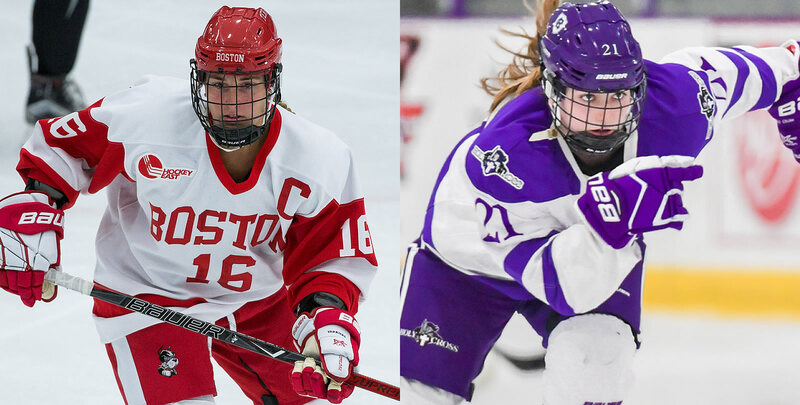 Julie Matthias (Thornton, Colo.) picked up four points on four assists in the win, while Rachel Moore (Falmouth, Mass.) found the back of the net twice for the Crusaders. 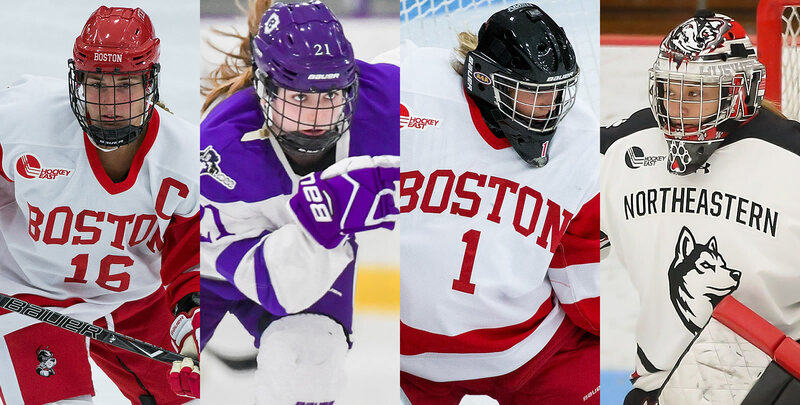 Boston University swept #4 Boston College in a weekend series for the first time in program history as the Terriers took Friday night's outing, 3-2, and Saturday's contest, 4-2. Sammy Davis (Pembroke, Mass.) led the entire nation in points (7) and assists (6) last week, including five assists in the sweep the Eagles while rookie netminder Kate Stuart (Chilliwack, B.C.) earned her first NCAA win in just her second start making 42 saves at #4 Boston College. UConn split a weekend series with #8 Providence as the Huskies downed the Friars, 2-1, on Saturday after falling, 4-1, in game one. Briana Colangelo (Whitby, Ont.) scored both UConn goals in Saturday's road win and the junior now has 12 points (5g, 7a) on the year. 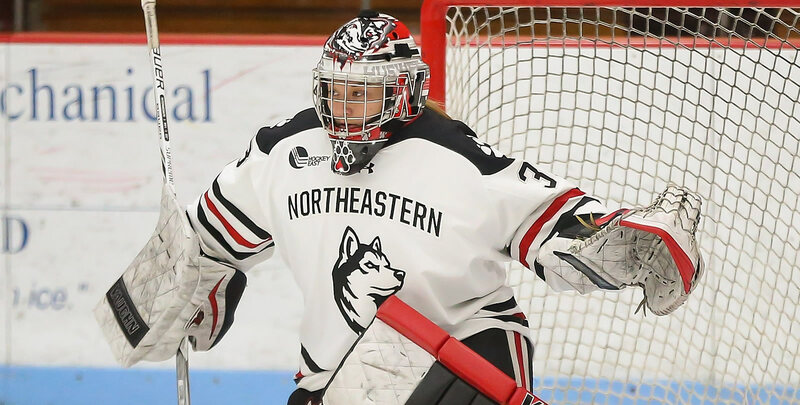 Northeastern's Aerin Frankel (Briarcliff Manor, N.Y.) posted another two wins, including her NCAA-best fifth shutout of the year, improving to 8-1-0 on the year. The sophomore currently leads the nation in goals against average (1.00) and save percentage (.964) after stopping 68 shots last week, including a career-high 46 in a 5-4 overtime win against Boston College on Tuesday. Maine and Vermont split a weekend series at Gutterson Fieldhouse. Vermont's Saana Valkama (Pirkkala, Finland.) picked up three points (1g, 2a) against the Black Bears, while rookie defenseman Maude Poulin-Labelle (Sherbrooke, Que) struck for the game-winning goal on Saturday. Maine senior defenseman Alyson Matteau (Mirabel, Que.) blocked five shots on the weekend, while goaltender Carly Jackson (Amherst, N.S.) stopped 45 shots in a 1-1-0 series stint. Sammy Davis (Jr., F; Pembroke, Mass.) paced the entire nation in points (7) and assists (6) last week, including five assists in a sweep of #4 Boston College. She set up Friday's game-winning goal as one of her four primary helpers on the week, also the most in the NCAA. On Saturday, she dished out three assists in a 4-2 win over the Eagles, matching her career high. Julie Matthias (Sr., F; Thornton, Colo.) picked up four points on four assists in a weekend split with #5 Northeastern, with all four helpers coming in a 5-3 win over the Huskies on Friday. It marked Holy Cross's first-ever win in Hockey East play. Kate Stuart (Fr., G; Chilliwack, B.C.) in just her second collegiate start, stopped a career-high 42 shots in a 3-2 win at #4 Boston College. 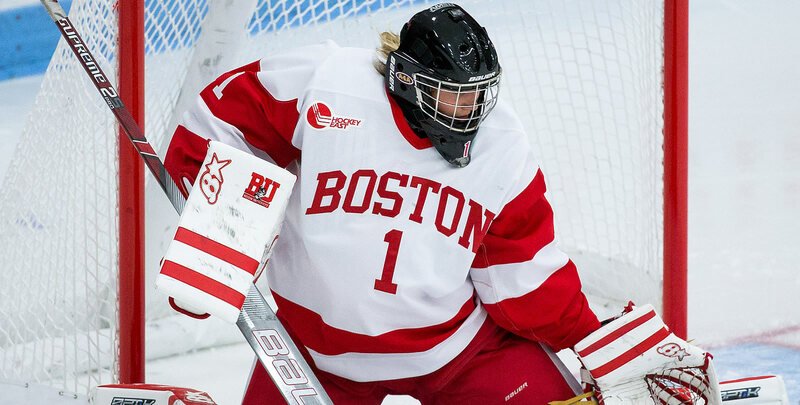 Fifteen of her saves came while Boston University was shorthanded and she kicked out all 16 she faced in the first period to backbone the Terriers to a 1-0 lead entering the first intermission. Aerin Frankel (So., G; Briarcliff Manor, N.Y.) went 2-0-0 with a 1.96 GAA and .944 save percentage and one shutout last week, including stopping a career- high 46 saves Tuesday in a 5-4 overtime win against #4 Boston College. She kicked out all 22 shots she saw Sunday in a 3-0 win against Holy Cross for her NCAA-best fifth shutout of the year. Makenna Newkirk, BC (Sr., F; Scottsdale, Ariz.) Led the Eagles with four points on three goals and one assist, including two power-play strikes against #5 Northeastern. Registered 11 shots on net in three outings and pushed her point streak to nine contests (5g, 7a). Megan Keller, BC (Sr., D; Farmington Hills, Mich.) Had three points (1g, 2a) to tie for the lead among all defenseman last week. She notched her fifth power-play goal Saturday at BU and put 12 shots on net. Abby Cook, BU (Jr., D; Kelowna, B.C.) Led all defenseman in the NCAA with two goals, both coming in a 4-2 win over #4 Boston College on Saturday. She also set up the game-winning goal in that contest. She fired 11 shots on net and blocked five shots as well. Jesse Compher, BU (So., F; Northbrook, Ill.) Was second in the NCAA last week with six points (2g, 4a), including Friday's game-winning goal, to help Boston University sweep #4 Boston College, winning two straight games over the Eagles for the first time since 2012. Briana Colangelo, UConn (Jr., F; Whitby, Ont.) Scored both UConn goals in a 2-1 road win over #8 Providence on Saturday afternoon. The junior now has 12 points (5g, 7a) on the year. Morgan Fisher, UConn (Jr., G; Vernon, Conn.) Went 1-1-0 in a weekend split with #8 Providence, including a season-best 43-save performance on Friday night and a 21-stop road win on Saturday. Carlier Magier, HC (Fr., F; Allen Park, Mich.) Scored a goal and added an assist in a 5-3 win over #5 Northeastern on Friday. She currently leads the team with six points on five goals and one helper. Jada Brenon, HC (Fr., G: Pendleton, N.Y.) Stopped 68 shots over the weekend split with #5 Northeastern, including 34 on Friday's 5-3 win to earn her first NCAA victory. Rachel Moore, HC (Jr., F; Falmouth, Mass.) Found the back of the net twice in Holy Cross's first-ever Hockey East win on Friday, a 5-3 win over #5 Northeastern. They were her first two tallies of the season. Alyson Matteau, ME (Sr., D; Mirabel, Que.) Netted Saturday's opening goal against Vermont and blocked five shots on the weekend. Carly Jackson, ME (Jr., G; Amherst, N.S.) Stopped 45 shots in a 1-1-0 weekend at Vermont and allowing just two goals per game. Taylor Wenczkowski, UNH (Jr., F; Rochester, N.H.) Earned four points on two goals and two assists in a Wildcat sweep of Merrimack, picking up a goal and an assist in each outing. She scored Saturday's game-winning, overtime goal to deliver UNH its third straight win. Lauren Martin, UNH (Fr., F; Cambridge, Ont.) Potted a power-play goal Friday night and won the most faceoffs of any UNH player with 45. Marie-Jo Pelletier, UNH (Sr., D: Dalhousie, N.B.) Tallied three assists this weekend, pushing her point streak to three games. She assisted on Saturday's overtime winner and dished out two power-play helpers on Friday. Alina Mueller, NU (Fr., F; Winterthur, Switzerland) Was tops among all WHEA rookies last week with five points (3g, 2a) in three outings. She scored two goals and chipped in a helper in a 5-4 overtime win over #4 Boston College on Tuesday and went on to score in a 5-3 setback to Holy Cross and dishing out an assist in a 3-0 win the next day over the Crusaders. Maude Poulin-Labelle, UVM (Fr., D; Sherbrooke, Que) Struck for the game-winning goal on Saturday against the Black Bears. Taylor Flaherty, UVM (Sr., D; Lakeville, Minn.) Found the back of the net against Maine and finished the weekend with a plus-three rating.